On June 7th, 2017, Reuters announced the Top 75 universities ranked in "Asia Pacific's Most Innovative Universities - 2017". 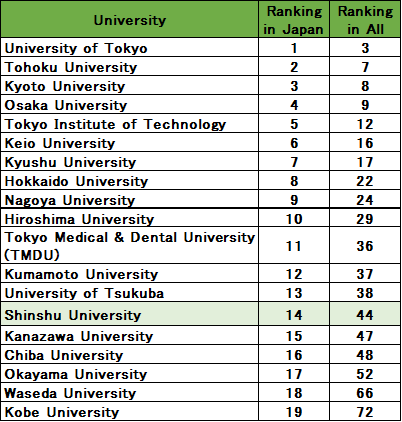 Shinshu University ranked 14th in Japan same as 2016 (ranked 44th in all). In cooperation with Clarivate Analytics, Reuters determined the ranking based on the analysis of academic papers, patent performances such as patent filings, patent success, patent citations. Please refer to the following web site for the details. "Asia Pacific’s Most Innovative Universities - 2017"